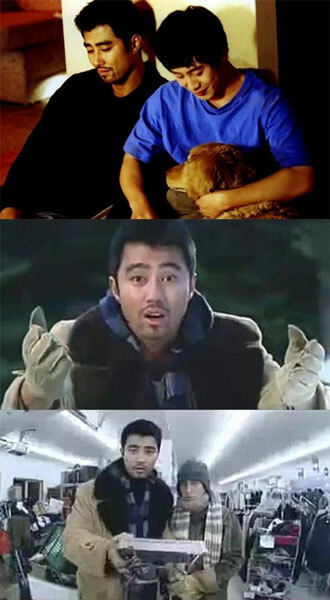 The look of Shin Ha Kyun and Cha Seung Won in a MV (music video) shot 12 years ago revealed. On January 3rd, 2012, on a bulletin board, a thread was posted with the title of “ancestor of Position”, along with photos. The photo published is the scenes from MV of I Love You MV sang by Position (포지션) from year 2000 which Shin Ha Kyun (with the fame of Brain) and Cha Seung Won cooperated, revealing the short-tempered past of Cha Seung Won and Shin Ha Kyun in the MV, and also their naiveté rookie image. The song of I Love You sang by Position is a remade from original song by Japanese singer Yutaka Ozaki. It’s recorded in his studio album titled “I Love You…” released on December 28th, 2000. Watch the I Love You MV featuring Shin Ha Kyun and Cha Seung Won, together with listening to a nice song on YouTube (or the version with English subtitle). A shorter song-only live concert version of Korean version of I Love You is also available on YouTube.